"Treat the customer and my co-worker as I would like to be treated” is the mission statement of Wells Brothers, a multi-faceted company located in Anna. This mission statement came about over 25 years ago when Wells Brothers began. Curt Wells, co-owner, told his wife, “If we ever have employees, I want to treat them the way I would like to be treated”. What started out with Curt, and his wife, Sandy now consists of 140 employees. company in 1990. Jerry brought his plumbing experience and knowledge to the company and thus the plumbing division was developed. Since 1990, Wells Brothers has expanded into 4 buildings, totaling 146,000 square feet, 149 trucks and a diversified skill set. Wells Brothers has evolved into industrial electric, industrial plumbing, HVAC, metal fabrication and assembly, machine rigging, system process handling, concrete & construction. Being so diversified has enabled Wells Brothers to sustain through the recent downturn economy. This diversification is a common thread when an employee is highlighted in their monthly newsletter. Time and time again the comment is that “The diversification makes it enjoyable working at Wells Brothers. There is always something different; a chance to learn additional skills.” This sentiment is very common among all of our employees. It’s due to their enthusiasm, the willingness to learn new skills and to satisfy the customer’s expectations that has made Wells Brothers such a fast growing company. 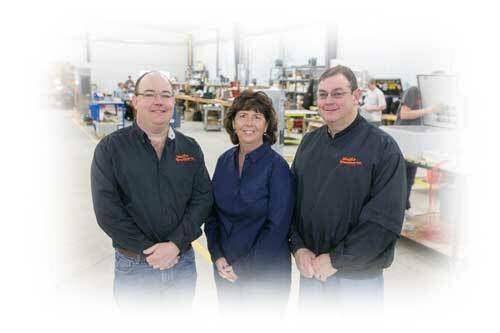 Wells Brothers began as family owned and is still family owned today. Curt, Jerry & Sandy have seen a lot of changes occur over the years. As Sandy puts it, back when starting out, she couldn’t wait to purchase their first fax machine so that quotes and such could be received by the customer much faster than traditional mail. Now the fax is almost extinct as everything is scanned and emailed. 2014 not only marked the 25th anniversary of Wells Brothers but also marked the beginning of a pilot program that Wells Brothers initiated in order to help employees be the best version of themselves. Wells Brothers achieved certification to be a NCCER nationally accredited training facility. We are offering our employees an opportunity to advance their skill set by taking ABC training classes here at our facility. These classes can be in the various skill sets that Wells Brothers offers and also in leadership training as well. Curt and two employees stepped forward and completed a “train the trainer” seminar so that they can facilitate the training to the other employees. A number of the employees at Wells Brothers have taken advantage of this pilot program to advance their career growth and skills.